(Quick Effect): You can target 1 face-up card your opponent controls; negate its effects until the end of this turn. When this card inflicts battle damage to your opponent: You can target 1 Tuner in your GY; Special Summon it in Defense Position. You can only use each effect of "Hot Red Dragon Archfiend Abyss" once per turn. 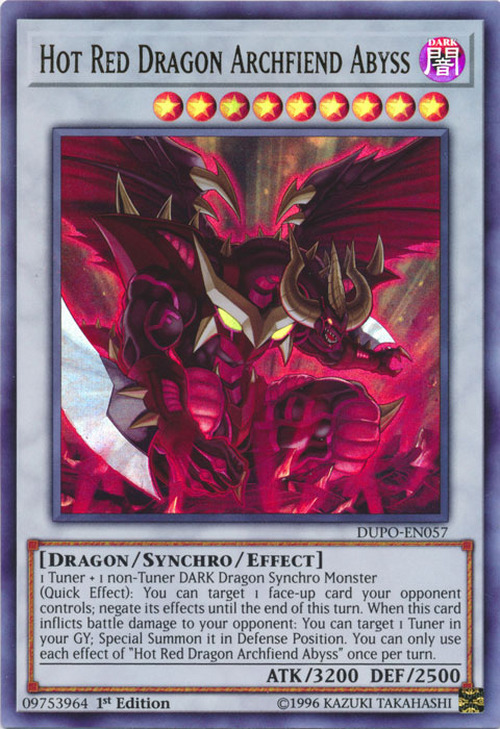 This card is an upgraded form of Hot Red Dragon Archfiend. 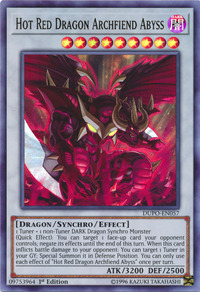 This card is the first evolved form of Hot Red Dragon Archfiend to appear in the manga. This monster shares the same Attribute, Level, Type, ATK and DEF with B. Skull Dragon and Archfiend Black Skull Dragon. Additionally, both monsters are demonic dragons that are Summoned from the Extra Deck and share the archetype Archfiend.